Maria Harding, born in Poland into an artistic family, performed for many years around the world as a Symphony and Chamber Violinist. She is a very experienced and knowledgeable teacher who enjoys sharing her wide range of musical expertise with her violin students. Maria was born in Gdynia, Poland and began violin at the age of 6 and piano at 10 years old. When she was 12 she was accepted into the prestigious High School of Music in Gdansk. She continued her studies at the Gdansk Academy of Music and graduated with a Master of Arts in Violin Performance with the highest honours. At the age of 20 Maria joined the Polish Baltic Frederic Chopin Philharmonic and The Baltic Opera in Gdansk, Poland and performed in many famous Concert Halls like – Gewandhaus Leipzig, Concertgebouw Amsterdam, Koln Philharmonie and others. Maria toured with the Orchestra in Poland and abroad including Germany, Italy, Spain, France, Belgium, the Netherlands, Sweden and the Czech Republic, recorded for Radio and TV programs as well as CD’s and performed a private concert for Pope John Paul II in Castel Gandolfo, Italy. Maria was also a member of the Polish Chamber Philharmonic in Sopot, Poland, performing throughout Europe including: Austria, Switzerland, Italy, the Czech Republic, Netherlands and Spain, as well as the United States and to Mexico for the International Festival Cervantino. She was very fortunate to share the stage with such great artists as Shlomo Minz, Ruggiero Ricci, Garric Ohlson, Kristian Zimmerman, Misha Maisky, Barbara Hendrix, Chuck Mangione, Carly Simon, the Electric Light Orchestra and Art Garfunkel. Maria also collaborated with the Warsaw Radio Orchestra for special broadcasts and recordings for Radio Poland. From a young age Maria has been passionate about chamber music, she participated in festivals, workshops, competitions and master classes in various divisions in Poland and abroad. From 2004 to 2008 Maria traveled the world as the leader of La Primavera String Quartet. During her active career Maria taught for 15 years in Poland, her students excelled in concerts and festivals and were admitted to conservatories and orchestras. 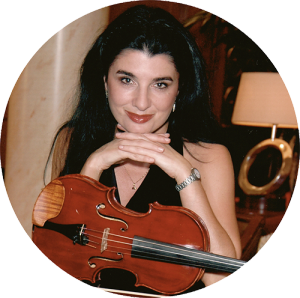 Upon moving to Vancouver in 2010 Maria joined the West Cost Symphony, Vancouver Philharmonic Orchestra, the Ambleside Orchestra as a guest Concertmaster and the Vancouver Chamber players. Maria offers individual lessons for children and adults of all levels, preparing for RCM exams, festivals, competitions, orchestral auditions and University entrance. Maria is friendly, positive, energetic and patient, she enjoys sharing the love of music and the art of the violin with others through teaching and performing in a fun yet informative environment.